Allegiant Air Adds Five New Routes In Florida – Aviation Week » OPShots.net - Cyberhub to Cleveland Aviation and the World! 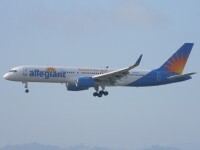 Allegiant Air will add five new routes this fall to Florida, continuing its strategy of connecting smaller U.S. cities with popular vacation destinations.One of the new routes—Belleville, Illinois to St. Petersburg-Clearwater International Airport—will operate on Wednesdays and Saturdays, two days that until recently Allegiant had scheduled relatively few flights. “We are seeing more opportunity in Florida on Wednesdays and Saturdays, and we are playing with the schedule a little more,” Allegiant spokeswoman Jessica Wheeler said. “You are still going to see more flights on Thursday and Friday than Wednesday or Saturday, but those are the margins of the utilization that we have been pushing to with the Airbus fleet.” She said Florida travelers tend to be more flexible about departure dates than other Allegiant passengers. via Allegiant Air Adds Five New Routes In Florida | Commercial Aviation content from Aviation Week. I started OPShots in June 2006 as a place to share and display aviation photos without the often restrictive policies of other aviation websites. I want to share my love of aviation with fellow aviation geeks and provide a spotlight on Cleveland Hopkins International airport in the process.